Mukesh Sharma: Rambi Police under its OC Sujit Lama in the course of NAKA checking duty at Rambi have Seized one maruti car having no. 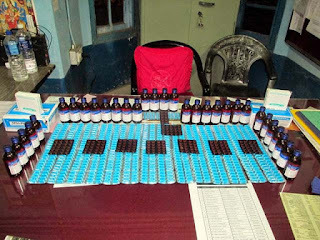 SK-01/PA-9471 n recovered 2510 pcs of Spasmo Proxyvon capsules , 43 pcs of cough syrup and 9 stripes of Nitrosun 10 tablets and arrested two Sikkimese persons namely Nayan Das (36) and Kharka Bdr Gurung (32) both of Yangang bazaar, Ravangla,South Sikkim yesterday evening . Both have been booked under NDPS act and was today forwarded to Darjeeling Court. Meanwhile Norbu Bhutia of 11th miles Delo Fatak, Kalimpong was too arrested from which and 20 bottles of cough syrup n 72 pcs of Spasmo proxyvon capsule was recovered at Lohapul Rambi. He was booked under Drugs and cosmetic act and was produced at Kalimpong court today.